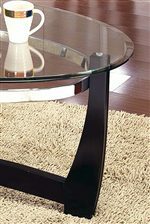 Bring a contemporary look into your dining room with this glass top dining table. A 48 inch round glass top with a tempered/beveled edge is featured. A painted black base with four legs support the glass top and shiny silver ring below. This table will create a modern appeal in your dining area. Pair with the Parson's dining side chairs to create a unique look. The Matinee Glass Top Dining Table by Steve Silver at Walker's Furniture in the Spokane, Kennewick, Tri-Cities, Wenatchee, Coeur D’Alene, Yakima, Walla Walla, Umatilla, Moses Lake area. Product availability may vary. Contact us for the most current availability on this product. MT480T Matinee Glass Top 1 48"